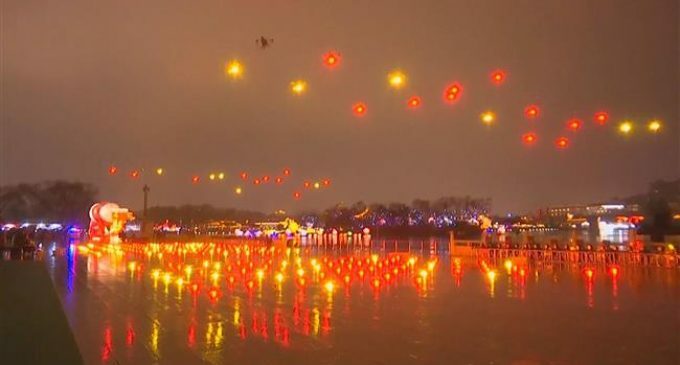 A total of 300 illuminated drones put on a spectacular light show Tuesday night in Xi'an, capital of northwest China's Shaanxi Province, to celebrate the Chinese New Year. To the tune of New Year soundtracks, a fleet of synchronized drones that were built with LEDs took to the air despite light rain. As they flew in formation, the UAVs transformed into various illustrations that included caricatures of the Chinese characters Fu (which stands for good luck, good fortune and blessing) and Xi (which means “joy”), as well as many other Spring Festival-themed animations. Xiong Yifang, who was the brain behind the show, said the drones were programmed to perform in sequence.